German Margret Wulf and her new caretaker Alicja Roszczyniala from Poland. 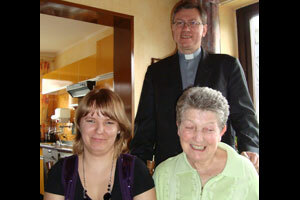 Marek Borzyskowski, Caritas Director from Grudziadz visited the two in Mrs. Wulf’s home in Germany. The first Polish home care providers supported through a German-Polish Caritas cooperation have started working in Germany. The project was created to bring together Polish home care providers and elderly Germans assisted by Caritas in their homes. Margret Wulf from Paderborn in north-west Germany is one of them. After two strokes, the 72-year-old needs assistance 24 hours a day. However, she wants to lead an independent life and stay in her own home. Now 22 years old Alicja Roszczyniala from Poland makes it possible, together with the local Caritas Home Care Service. The Caritas in Alicja’s hometown Grudziadz cooperates with Caritas Paderborn and helped the two women come together. “I’m not going to let her leave,” said Mrs. Wulf, smiling. She is happy to have found a home care provider she can trust. After a bad experience with a different Polish woman, Mrs. Wulf had almost lost hope. The good match between her and Alicja is not a coincidence. Caritas does not just function as a placement agency between elderly Germans and Polish women willing to work as home care providers. It offers preparation and assistance all along the process and makes sure both parties get the most out of their experience. In Poland, potential homecare providers can get advice from the local Caritas. They can take German classes which improves their chances of integration abroad. Caritas in both countries also offers help with paperwork and organizes first encounters in person, so that possible matches can find out if they fit together well. Only legal work placements that guarantee the Polish women a certain wage level and paid holidays are considered. Once the homecare provider has arrived in Germany, the local Caritas takes over. They will make sure the Polish woman does not feel isolated in Germany. They will help her cope with her tasks and offer advice on her work if needed. The women are also offered the possibility to attend church services and integrate the local church community. If the caretaker has children back in Poland, Caritas will check on them regularly to make sure they are not neglected. So far, the feedback from all the people involved is very positive. The language courses could be less theoretical, is the only thing Alicija can think of as a critical remark. Not a major problem for her though since Mrs. Wulf is teaching her new words every day. The elderly woman is happy to be the one helping out for once.